A couple years ago I launched my first board game. It was a success with Kickstarter and the critics, but not the marketplace. These are the lessons I learned from that first experience. It’s what I keep reminding myself as I test the next batch of prototypes. This is what I’ve got to say, one first-time-and-out-the-other-side designer to you, in the middle of your first time. This isn’t the masterclass. It’s not the stuff that’ll make all the difference once you have the basics down. It is the basics. The stuff you want someone to tell you first. You’re a veteran of many games, and odds are, your instinct is to make a Gamer’s Game: Something rich and deep with layers of nuance that are revealed play after play. Games that anybody can master in five minutes rarely hold your interest. The thing is, it’s really, really hard to write a game like that in a way that new players will get into. Especially coming at this with a background of computer games, where the mechanics are handled for you. And roleplaying games, where having a shelf of books with bonus mechanics to dive into when you’re ready is a plus. For board and card game, engaging with the mechanics is the play. If a player can load that ruleset into their head without confusion, they’ll enjoy their first play and come back for more. So be merciless. Trim elements from your game until you find the minimal heart of that sparks the fun, with every other element set to the side. Once you’ve found that, you can start putting the trimmed elements back in, one at a time. You’ll see which ones give you the most bang for your buck, and which ones are the stumbling blocks for new players. You can always make it more complex in an expansion. There will be game mechanics that you love, but that new players stumble on. Those can come back later, once your player has mastered the core game and they’re hungry for more. With your audience, you won’t even have to wait: You can bundle expansions as stretch rewards that your Kickstarter campaign is sure to hit. Your game is already more complex than you know. The coming step – making your game ready to play without you there to teach it – is going to rub your nose in it. Be ready, ‘cause the next section of development can be a slog if you don’t force it to stay fun. First off, writing everything down is going to point out every assumption you made about what the players already knew, and how much harder it is to explain things in a one-size-fits-all rulebook. The silver lining is, when you’re not there, the players don’t get to interrupt you for explaining things. You get to set the training down in Your Ideal Way. Part two of why this step wants to be a slog is the criticism. Starting from “We couldn’t understand it” and working your way up to “There’s a contradiction on page 7”, this step is all about reacting to negative feedback. Not inherently fun. Turns out, writing a game down well is nearly as much work as inventing the game in the first place. One you should, one you shouldn’t. Or for you, maybe not. You can hand this one off to a pro. Normally a new designer starting out would be stuck with this step, but you’ve already got the industry contacts that developer-publishers will line up to polish your game and get the publishing contract. Taking critique on your writing is hard when it’s your game, your baby. But hand it off to another developer and it’s a job with problems to be solved. They don’t have your emotional investment, and they’ve leveled up from doing this many times before. Of course, they’ll want a cut. A big one. But you’ve got leverage to negotiate with and having someone else handle the steps going forward will free you up to get back to design. That’s the rule of thumb for the hobby game industry. There’s so much more to say about this, but that’s the short version. What you need to know as a designer is that every part adds up. Every card, every punchboard, every die-cut-pattern, every bit. Once you’ve written your own game, you might start to marvel at the economy of components that hit games are made with. There’s a couple ways you can estimate the costs of your game. The first step, either way, is to figure out exactly what parts have to be made. Clear off a table. Unbox your prototype completely and set it into piles: board, cards, tokens, wooden/plastic parts. Write down that list. Remember the other parts that aren’t in your playtest kit yet: The rulebook and box liner. And the box. Step two, version one: Find a game in your collection with nearly identical or slightly more components. Your MSRP will be about the same as its. Step two, version two: Fire off a letter to a printer with your parts list, and ask for a quote request in two versions: 2,000 and 5,000 copies printed. 2,000 is a normal size first-print for a hobby game, to test market reception. 5,000 is a healthy size reprint for a game that the market has picked up. For a first print quote request, I’d recommend Ludofact of Germany. They’re great about breaking the print quote down by parts, showing you what is adding to the cost of your game. And they’ve printed more than half the Spiel des Jahres winning games of the last 30 years: They’re proven veterans. With a quote like that in hand, you can go back and take a second serious look at which parts of your game are the core, and what parts are delivering the most fun in the space remaining. Now the 15-20% rule is one you can break: With your audience and the interest you’ve built blogging about this game for more than a year, your game should Kickstart strong enough to justify a 5,000+ copy print run immediately. That’ll lower your per-copy-cost below what a publisher could normally plan around. Also, the 15-20% rule is built on the economics of selling publisher to distributor to brick&mortar merchant. (Optional extra step: Add “fulfillment house” in between publisher and distributor.) For your Kickstarted batch, you’re selling direct to the customer. Your leftover profit margin is much higher. You’ll be tempted to expand the game back to it’s full original version, with all the stuff you had to cut. That margin is your bankroll for keeping your game in print, and adding stretch rewards for your backers. These bonus rewards can be expansions for later buyers, or convention giveaways, or other promo items. You’ve made it this far with the core game simple. Keep it simple! If you build the core game to the point that the economics only work with a 5,000 copy print run and direct-sales-to-buyers, then you’ll have a devil of a time keeping it in print after the KS campaign is done. You’ll also be no friend to the hobby stores that you’d like to carry your game. If your economics still work with 2,000 copy print runs, your bases are covered for most any future. So that’s it: Tabletop Game Design for Publishing, the Going From Alpha To Beta, What I Wish Someone Had Told Me. No, wait, one last rule. The most important one. Keep having fun. As long as you’re still having fun, you’ll keep at it ‘til it’s right. As long as you keep having fun, you’ll take a 20 on your roll. By request of the business, I’ve pulled the report on Shanghai Magicraft’s factory from the tour reports. There wasn’t anything scandalous in it. The owner just said that he’d rather have a report on his new facilities after he expanded his business. Panda Game Manufacturing of Shenzhen, China has earned a place as the go-to printer of the Kickstarter publishing community. 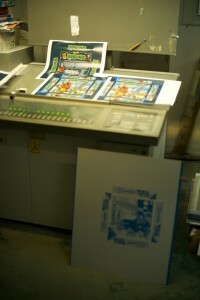 With a winning combination of a eurogame-level focus on quality going into pre-press, and native English speakers in their Vancouver corporate office acting as the go-betweens to the factory in Shenzhen, they’ve carved out a place for themselves that’s made them the up and coming big printer alongside eurogame old-guard Ludofact of Germany. 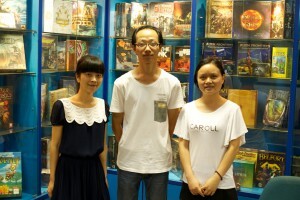 My guides to the Panda Games factory in Shenzhen: Sunshine, John, and Cherry. Starting in Panda’s showroom, I was first impressed by how many of the games I’d played and loved had been printed there. It’s an impression that would be repeated as I was lead about their printing floors, seeing time and again games that I had enjoyed in reprint, and new games from Kickstarter campaigns that I’d gotten excited by and backed. 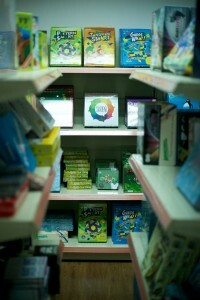 And then there was my first game, “Lyssan” on the showroom shelves, which they’d printed just the year before. 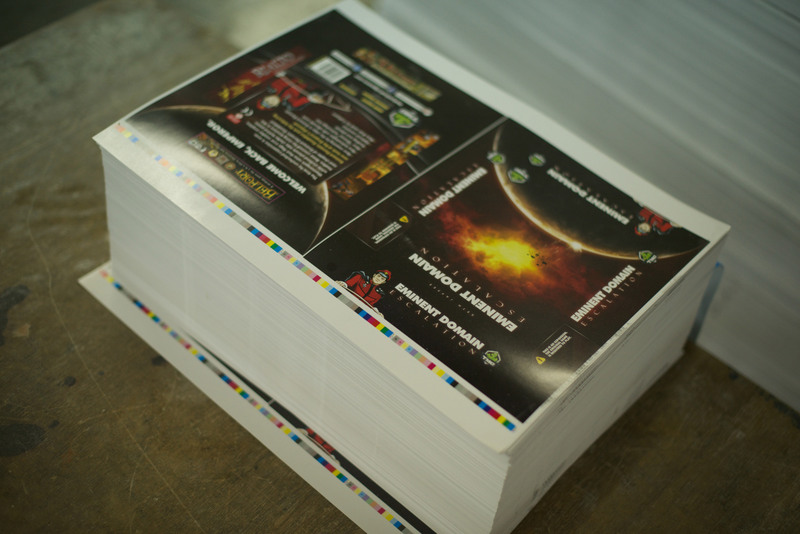 Printed box labels, stacked up and ready to be cut for Eminent Domain: Escalation. At one of the hand-work tables, workers stack up components for Dice Hate Me’s “Compounded”. 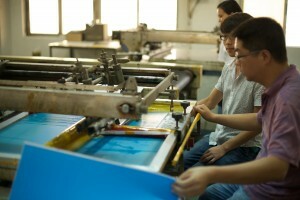 Panda, founded in 2007, grew out of the Shenzhen Bofung Printing Group. Bofung dates back to the early 1980’s. In just 6 years, Panda has already expanded to supply a majority of their parent company’s work. The key to Panda’s success may come down to two things: Native English speakers at the corporate offices in Vancouver who make dealing with Panda easy for publishers. That, and a focus on quality. Panda starts with the assumption that you want to print your game at a quality level to equal or surpassing the expectations of the eurogame market. 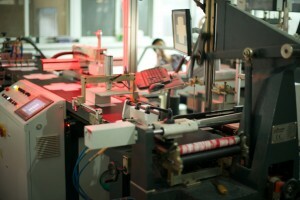 Like other large boardgame printers I toured, Panda works with greyboard and does offset printing directly. They’ll make your boxes, punchboards, and rulebooks in-house. (I’m told they also do card decks in house, but missed it when we toured.1) For wooden components, and plastics, they’ll be your liaisons. Panda sources from factories that they’ve built up relationships with over the many games they’ve made previously, getting you meeples, dice, and other components to meet your expectations. 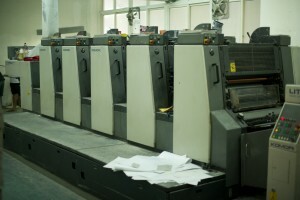 The heart of the operation, the workhorse of the game printing industry: A 5-color Heidelberg Speedmaster offset printer. One of these will turns out thousands of printed sheets per hour, once the proofing is done and the settings are tuned and locked in. For extreme spot highlights, Panda has a part robot, part manual screen printer. The workers position each sheet, and a single button press activates the robot to lower the screen, print the gloss, and release the results. 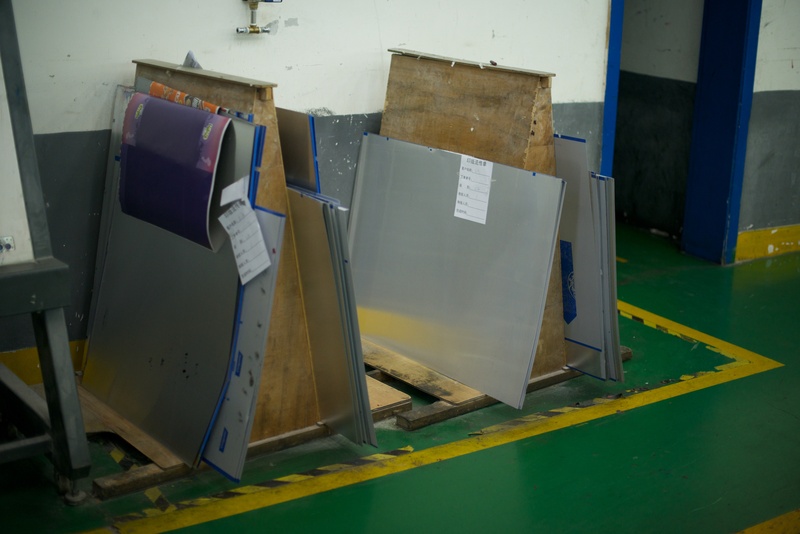 The second worker then clears the space for the next, and does a quick quality check before putting the sheet on the UV-curing conveyor. 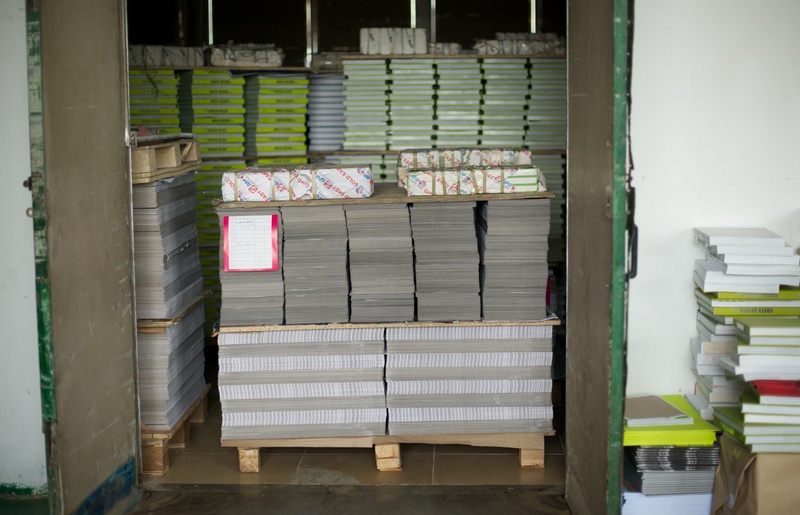 Panda’s printing facilities include full support for hardbacks in-house. 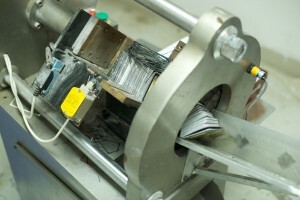 This bookbinding machine will stitch and glue together multiple signatures into a codex. Deluxe RPG books, anyone? For a more typical boardgame rulebook, this machine will fold and staple-bind single signatures. 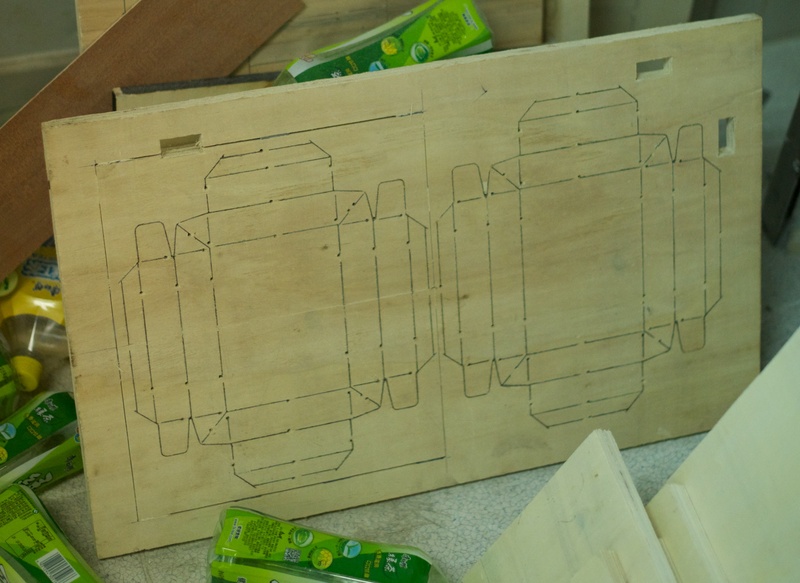 One extra step of the game-making process Panda did in-house that I hadn’t yet seen elsewhere is making their own dies, for die-cutting the boxes and punchboards. I had to spend a few minutes nerding out over their laser, which cut the grooves for the blades of the die to be slotted into. 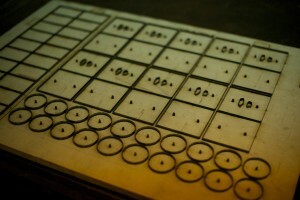 A laser table is a great tech for this purpose: A CNC laser cutter will take in a computer file and produce cuts down to a precision of a thousandth of an inch, just how they were in the file, in the board that holds the die blades. These then act as a guide & structure for the blades that stamp out a game’s punchboards of tokens, or the box tops and bottoms themselves, before they’re folded up. 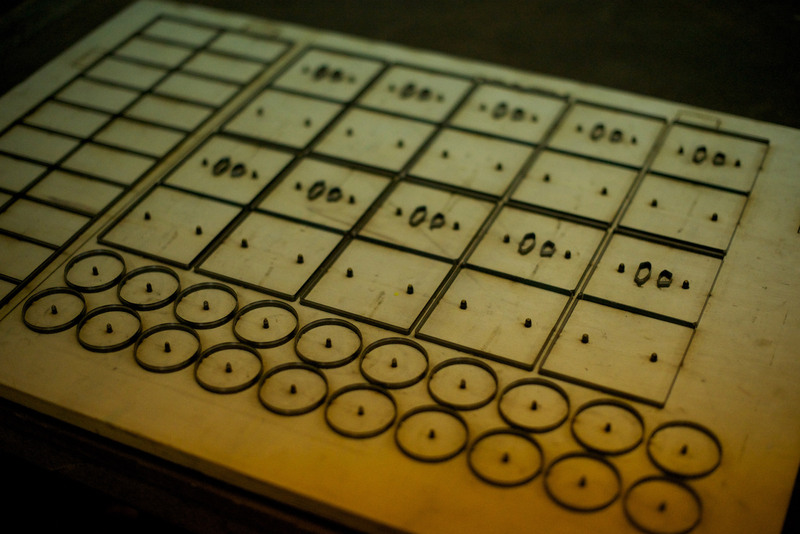 Making a die is a one-off job for each pattern of punchboards in a game, and lasers excel at high-precision one-off jobs. 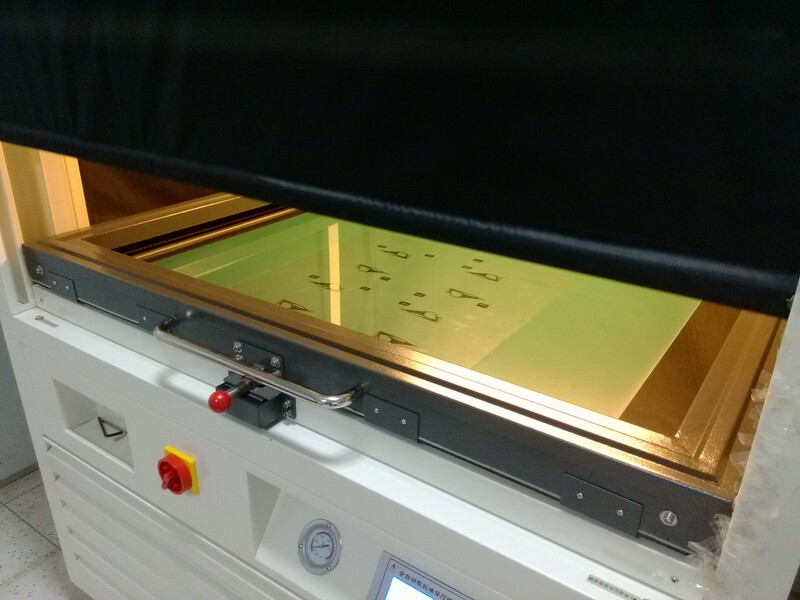 The board being cut is protected by a spare sheet from another game print, keeping the soot from blowing back onto the wood as the laser burns the grooves. Another place Panda shines is their attention to details that matter to game publishers. 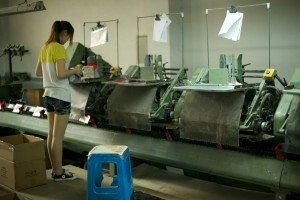 Where other large factories I toured might have only a single room set aside to drying print jobs, and that room might even be empty in the summer heat, Panda had multiple rooms set aside to drying and those rooms were in use. Panda’s been around this rodeo many times now, and they know that the final detail of drying the game parts can be there difference between a game whose boards warp a few days after opening and one that stays beautiful. Drying Room #2, packed to the gills. Games focus: Panda does games, and they’ve been doing it with an intense focus for the last six years. Native English speakers: Panda’s corporate offices are in Vancouver, their factories are in Shenzhen. 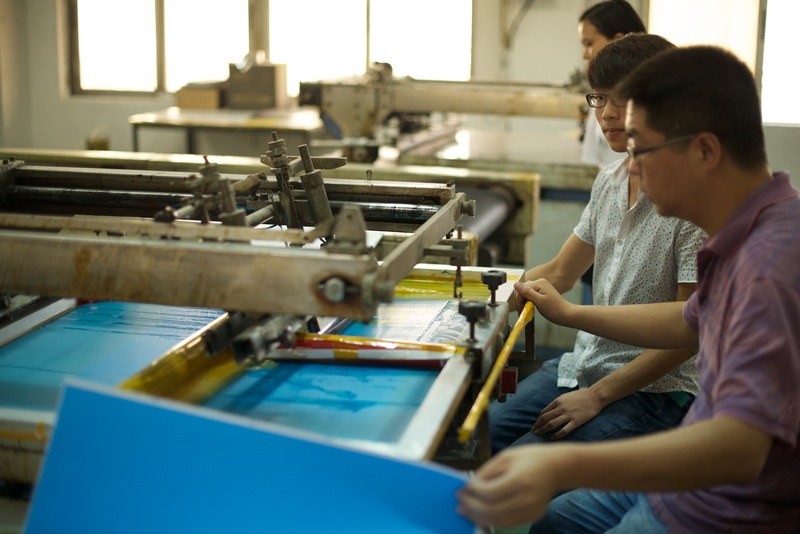 Michael and the rest of the Vancouver team will be your liaisons in the printing process, and will spare you much of the confusion of dealing with non-native English speakers. A focus on quality: Panda starts with the assumption you want to make a game to the quality level of the eurogame market, not the big-box store mass-market or cheaper. Dealing with Panda, you’ll spend less time than with other printers going over your quality expectations and component selection. If you’re a new publisher and are asking for advice on component selection, they’ll be advising you based on the assumption that you’re looking to make a beautiful product, and not cutting corners. When deadlines loom and tense eMails are exchanged between printer and publisher, the folks at Panda will often fall back on reminding you of their reputation for quality, and assure you that if they let mistakes through, they wouldn’t have kept that reputation. And much of the time, they’re right and you’re worried over nothing. But you still have to hold up your end of the bargain. Inspect each thing that comes back from them to make sure it meets your specifications, and don’t be shy about sending back the polite “this doesn’t look like what I sent you” letters when you have to. I’ve compared notes with many other Kickstarter-based publishers, and everyone I asked agreed on this point: We love Panda, but sometimes you’ve got to keep hounding them to make sure they deliver the product as specified, even when they want to fall back on their reputation. At the end of the day, Panda will make a beautiful game for you. But as proud as they are of their quality controls, you still have to do your due diligence. 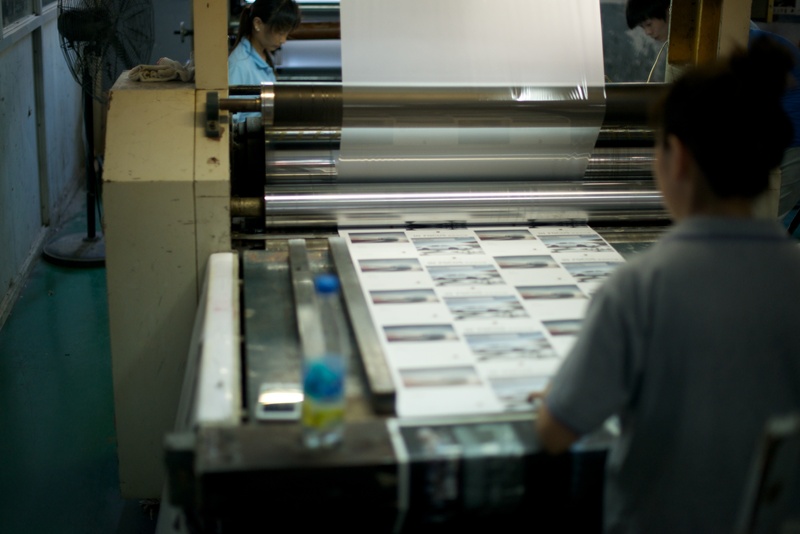 If you’re paying attention, you may notice hints of growing pains when printing with Panda. These guys are slammed with work, especially around the middle of the year: the months before the convention season before the holiday season. This, combined with their careful pre-press process means they need a few weeks longer lead-times for pre-press art approval than other printers. 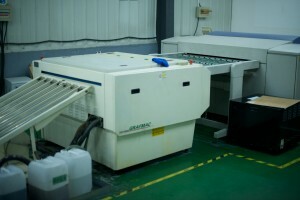 They can also command a higher price than most of their Chinese competitors, and have slightly larger minimum batch sizes: 1,500 rather than the 1,000 other large printers require. “We have expanded our team to include two full-time account managers located in Indianapolis, USA. This will greatly increase our service levels, response time, and should allow designers and publishers more opportunities to meet us face to face (Vancouver was a little too far from the action). This location was ideal to us as it is in the EST time zone and within close proximity to large gaming events such as Origins and Gencon. The original text said that Panda contracted out deck making, rather than doing it in house. Michael informs me that Panda is now doing decks in their own factory. The text of the article has been amended to this. I’ll have to bug Cherry and John to show me the deck cutting machinery next time I’m there. Signs of success: Panda has grown to the point where they have one of these die-cut monster machines alongside the single-worker die-cut stations that most games are cut with. If you’ve got an especially huge job, your game might be cut out on this behemoth. 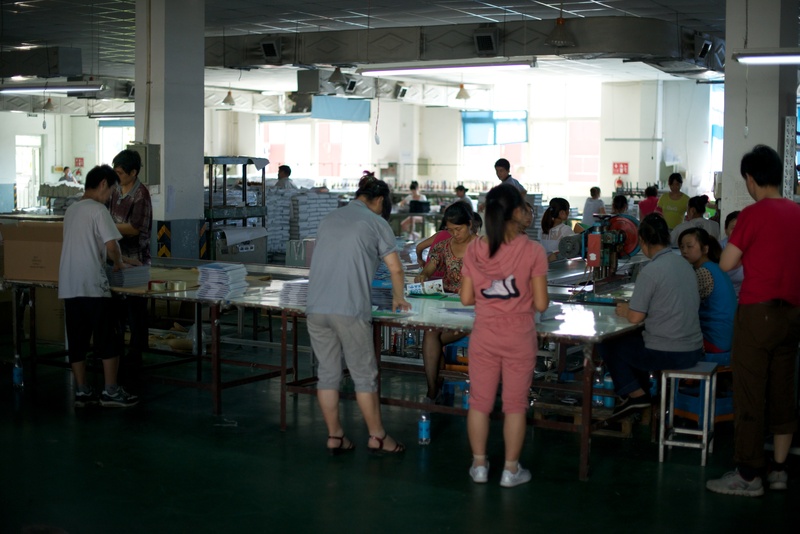 Ningbo Lijia does the printing for a few games you might have heard of: Monopoly. Twister. Recently, they’ve been making overtures to publishers of Kickstarted games and Eurogames. Ningbo Lijia is “Lijia” for short. 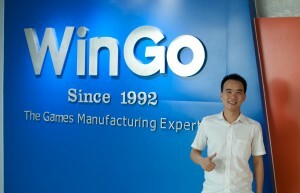 Ningbo’s the name of the city they’re located in. “Lijia” is their proper name. This is how placenames go in Chinese: You zoom in, from the broadest to the most specific. So saying “Ningbo Lijia” in Mandarin makes sense the same way saying “Honda of Brooklyn” would in English. If you’ve published before, you might have Lijia parts in your game without knowing it. 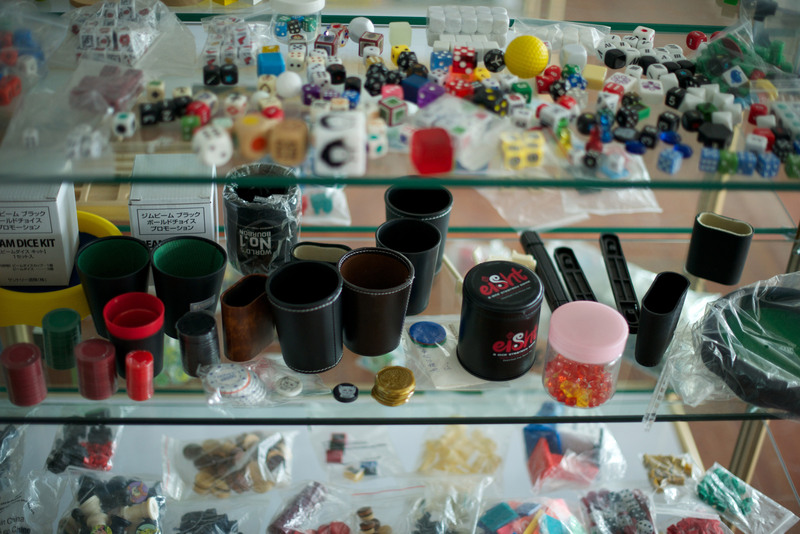 Several other publishers turn to Lijia to do their plastics, meeples, custom dice, and more exotic components. 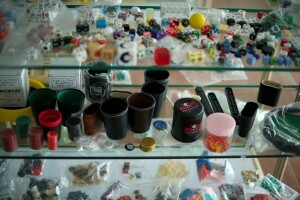 Dice, shaker cups, and other plastics. From what I’ve seen – and short hours forced us to cut our tour short, so I can’t speak to all of Lijia’s qualities – this is Lijia’s big strength. They’ve been asked to make any number of exotic game parts before. Large plastic boards, metal tins, rubberized play mats, and stranger things. 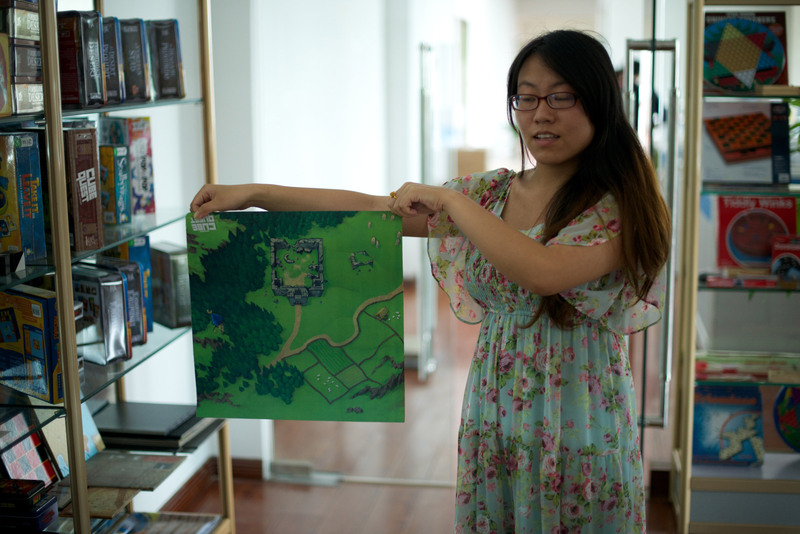 Here’s Melinda showing one of those unusual game bits: a rubberized mat. You’ll likely end up talking to Melinda. She has the best English of the crew I met at Lijia. Like I said, the tour was on the brief side. My hostel was hard to find, but the driver they sent to pick me up persisted and eventually found me. 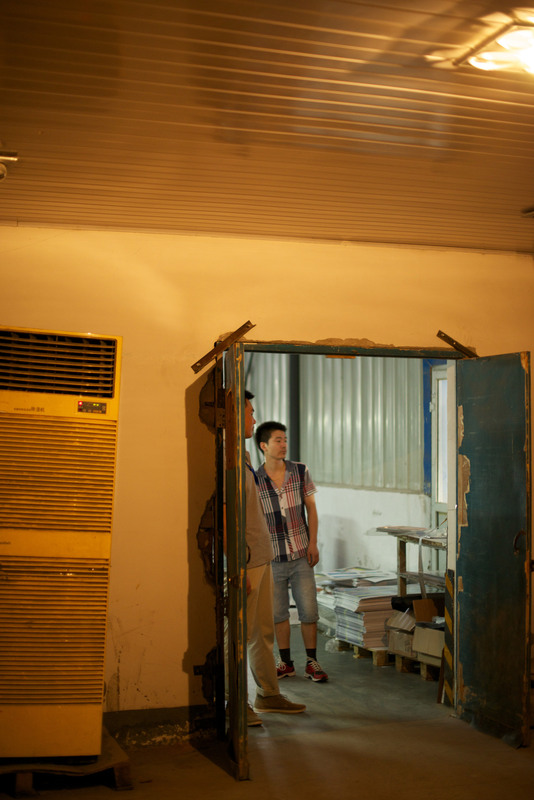 We met at their new corporate HQ – Lijia just moved their office workers out of the factory recently. There was a tea ceremony where the first cup was poured over a frog idol to bless our fortunes together. Somewhere in the middle of that, I got to see their showroom of games they’ve made. It’s an extensive display. One small corner of a large showroom. 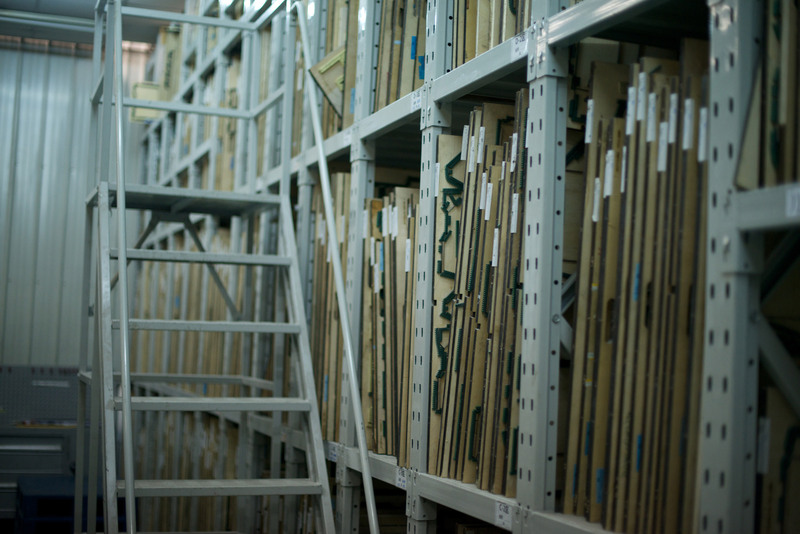 From there, we toured the first of three workshops: The paper workshop. Here, Lijia keeps their own 5-color offset printer, the heart of their printing operations. 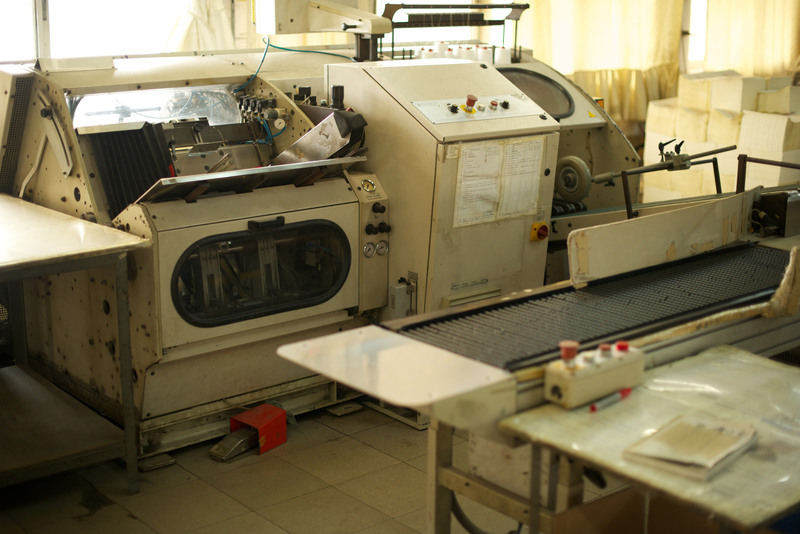 There’s a variety of die cutting machines, one laminator, and numerous hand-work tables that follow from the work the main offset printer starts. 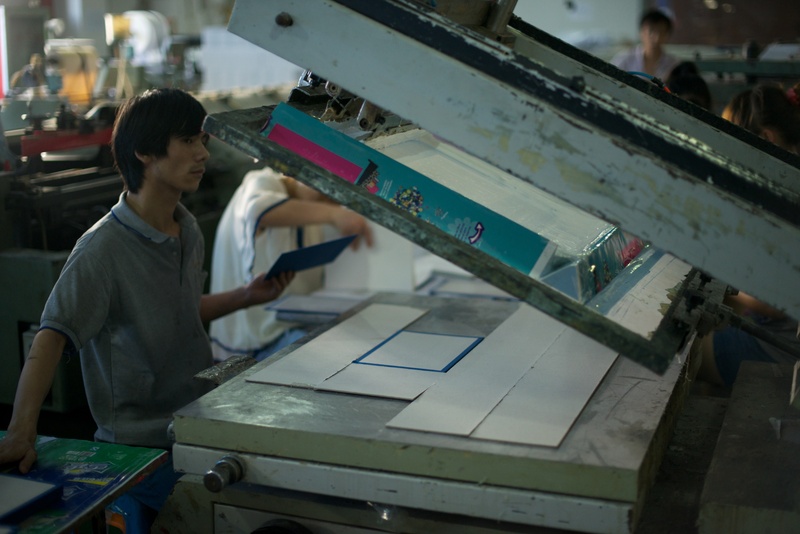 The heart of Lijia’s print operations: A 5-color offset print stack. Prints being proofed. 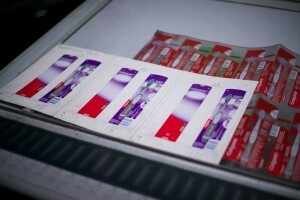 Below, you can see one of the 5 master plates that applied one color. Getting these to all line up is a big part of getting the print right. There are two whole workshops I didn’t get to see on account of short hours with Lijia: The woodworks and the plastics workshop. Boo. Most game factories don’t even have those sections, outsourcing their production needs to others. Lijia is usual for having them in-house. Unfortunately, no report on those, ’cause I never got to see them. Capacity: Lijia routinely turns out hundreds of thousands of copies of mass-market games. Component manufacture in house: Pretty much all game companies do final assembly in house. 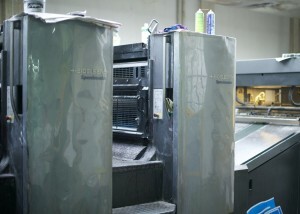 Many do printing in-house, too. But doing plastics and wood in-house is unusual. This, and the long list of stranger things Lijia has sourced for game publishers might be their biggest strength. Talking with them about quality expectations, component by component. I’m a big fan of the Eurogames look. 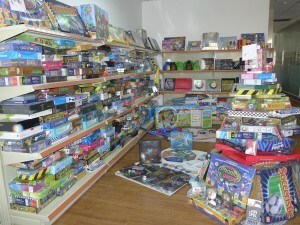 Lijia does the bulk of their business in mass market games, like Monopoly, Twister, and others. These games are more optimized for low cost. 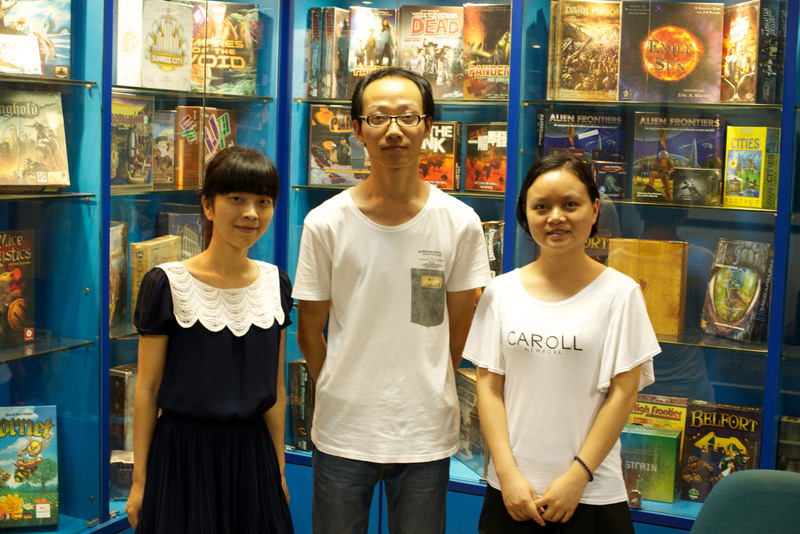 I’d take time to talk with Lijia component by component, making sure we were on the same page making a games at a quality level that’s going to look right at Essen Spieltage, rather than a game that can be priced for big box stores. 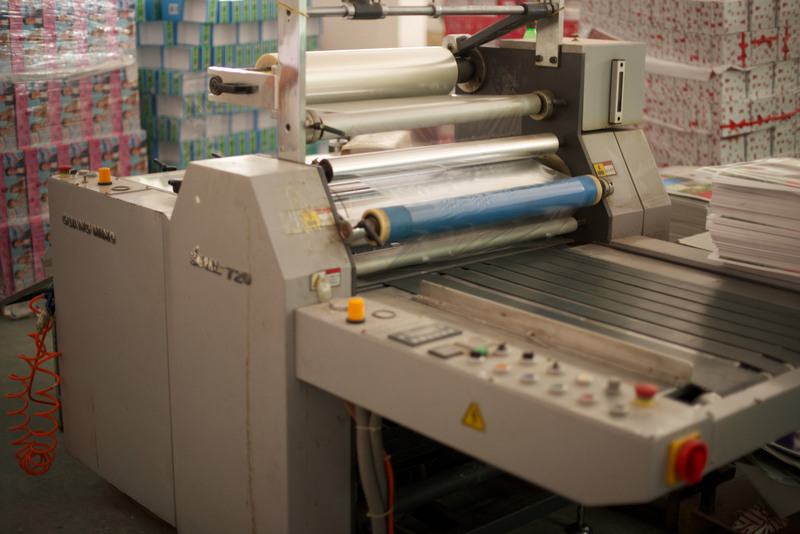 Longpack is a big printing company, with roots in the packaging and book printing business. Now they want to move into games. They point to the expertise, hardware and the contacts they’ve built doing print contracts for the biggest companies in the world as proof that they can handle your next game. My tour guides at Longpack were Ning Pan and Charles Kong. Ning is a company higher-up, enthusiastic to get Long into board game printing. Charles was a recent transfer to the company from Shanghai General Motors. 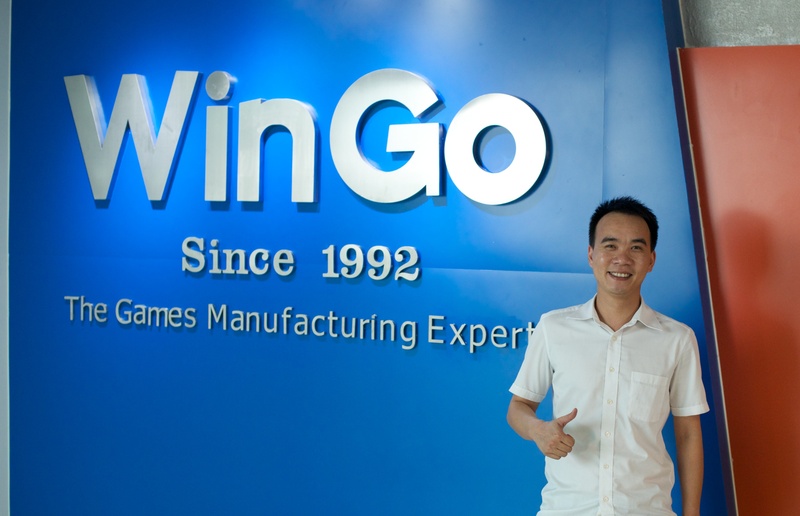 He was enthusiastic for the chance to bring his industrial design experience to bear on making injection-molded plastic parts for games. Longpack has been in business since 1999, with a focus on packaging and book printing. They say they’ve been watching the success of Panda for the last 4 or 5 years, and want a piece of that action. They’re coming from a similar background (growing out of an established printing company), giving them many of the same strengths, starting up. The tour starts in their Computer-To-Plate printing room, where the metal master plates for their offset printers are made. Mostly, this room looks like every other CTP rig I’ve seen so far. One change hints at the added efficiency needed for Longpack’s CTP to keep up with the rest of their sprawling factory complex: They’ve rigged a feed between the plate printer and the rinsing machine. 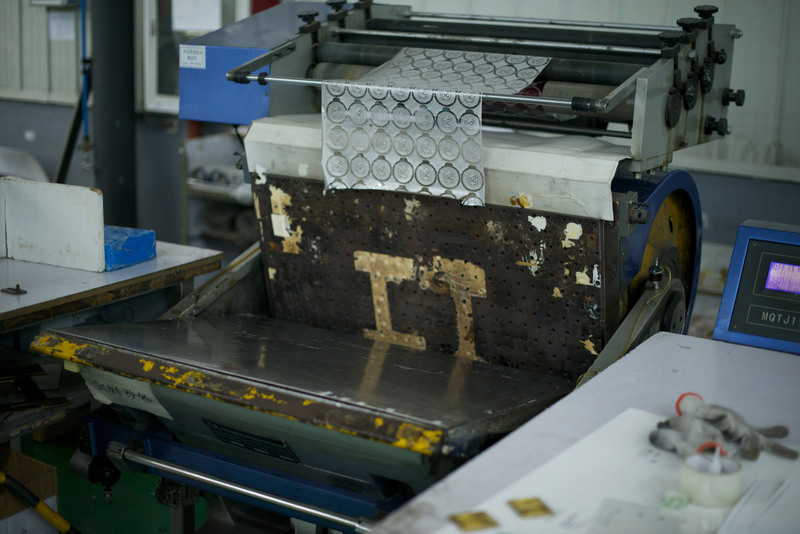 The graphic designer doesn’t have to leave her desk to move the plate from one machine to the other. 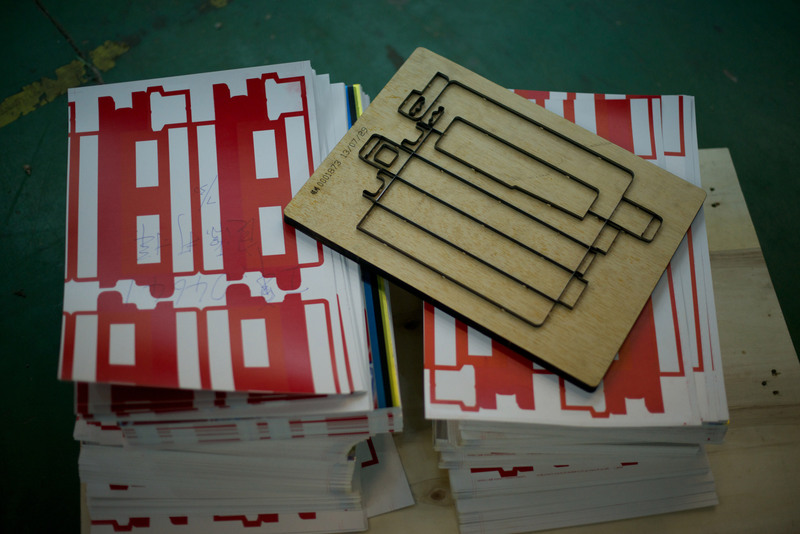 Printing plates, hot off the CTP press and stacked up ready for use. From there, we step out into a half-football-field sized room of offset-printing stacks. 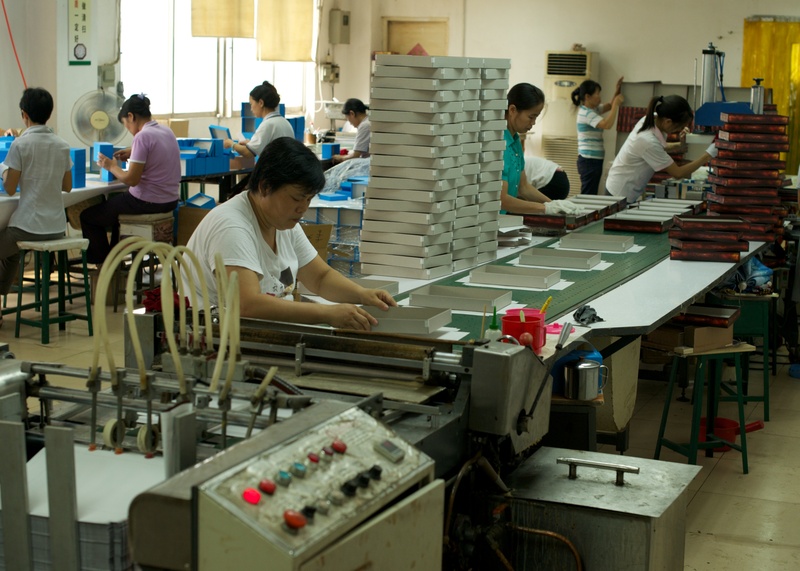 Walking through here, you see boxes being made for products you’ve actually used. I saw brands of toothpaste I’d brushed with, breakfast cereals I’d eaten, and more. Longpack regularly turns out hundreds of thousands of cardboard boxes for the largest companies in the world. 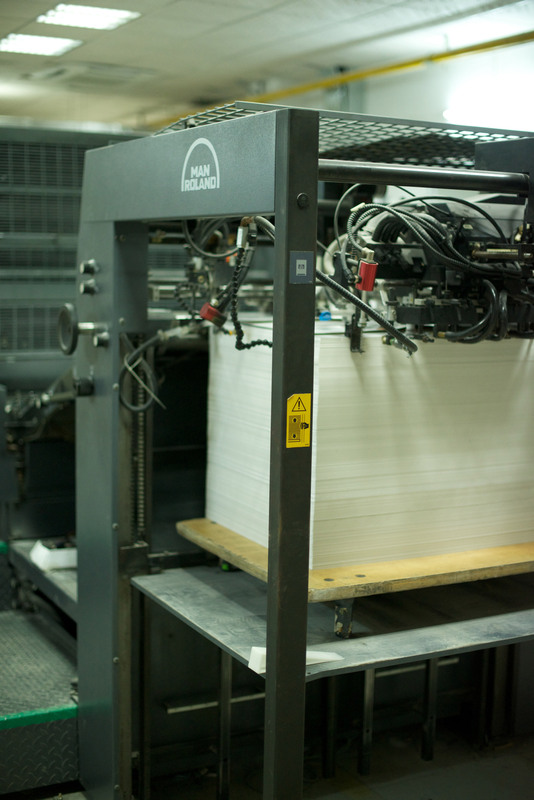 Also, their printers include longer rigs than the industry-standard 4-color printers. Their biggest rig is a 6+1 tower printer. So it could do 6-color printing for especially vibrant tones. Then the +1 station could add spot gloss. Or you could use it to add a pantone shade, if you had a color that had to match your brand perfectly. The 6+1 monster offset printer. 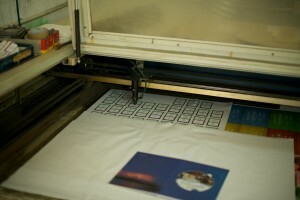 Print proofing with a three-up: The two sides show the lightest and darkest prints that are within tolerance. The one in the middle is juuust right. 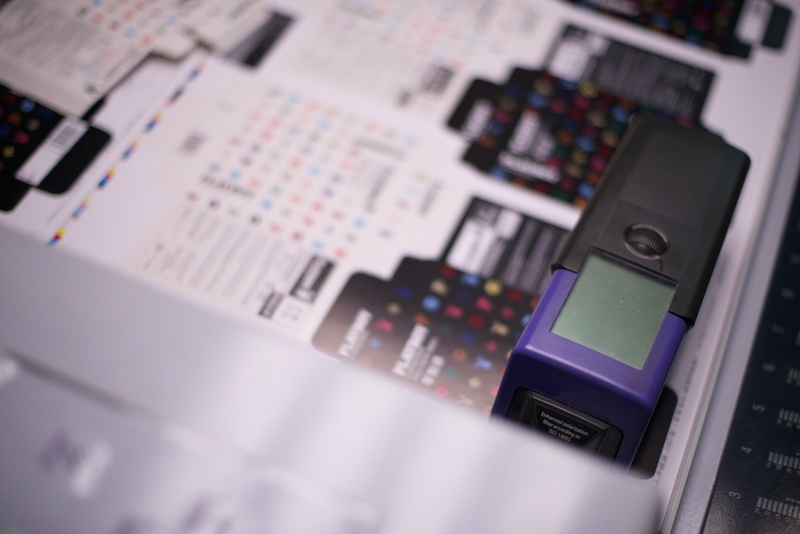 Longpack uses digital tools to check that colors are being printed within tolerances. 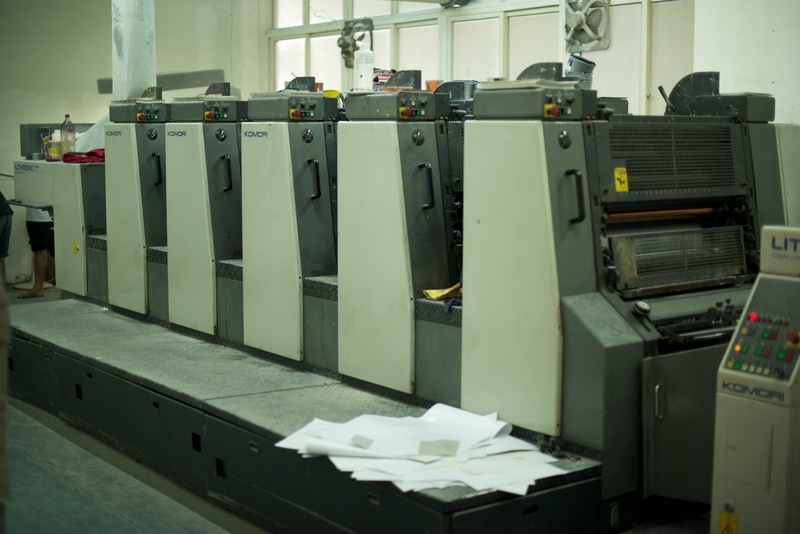 Come out the other side of the print floor, and you arrive in a room of assorted machines to do specialized tasks at a rate of thousands of boxes per hour. 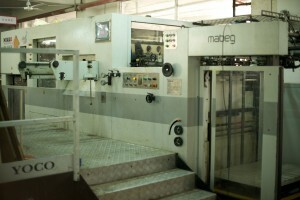 They had a couple different truck-sized die-cut machines that could keep up with the rate their offset printers turned out boxes. 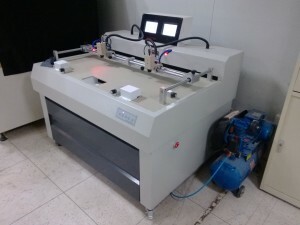 Another machine for folding together and glueing boxes at a similar pace. A little manual foil-embossing machine nestled between those two. Actually, most of these machines other than the printers WOULDN’T be used in board game production: They’re specced to work (very quickly) on thinner grades of cardstock than the 2mm chipboard most boardgame boxes, boards and punchboards are made from. To see the machines that are going to turn out your laminated chipboard components, you take a drive to Longpack’s boxmaking workshop. This monster die-cut machine stamps through 10 sheets of cardstock a second. 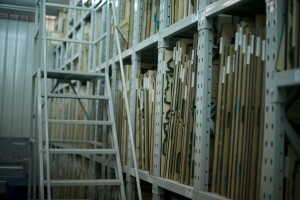 Racks of stored dies for cutting. A die, shown atop the print it will cut. But it’s good knowing that the machines are there. If you wanted to do something exotic with your box inserts, anything from having a printed insert to a cellophane window, they’ve likely got the tool for the job. Longpack’s wide variety of specialized packaging machines should make it possible to really stretch the bounds of game inserts and packaging, if you’ve got the budget and the will to go that extra mile. 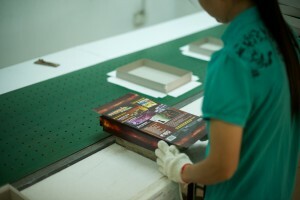 The boxmaking workshop might be of the highest interest to game manufacturers. This is where Longpack die-cuts, laminates, and folds chipboard. 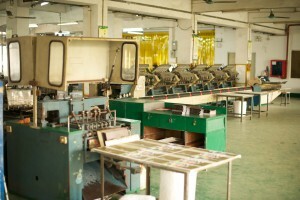 In other words, this is where your game boxes and your punch-boards of tokens are made. The machines here are heavier duty. They don’t run nearly as fast as the 6,000 die-cut-an-hour monsters back in the packaging workshop, but they’ve got the force needed to do their job on the 2mm chipboard that’s industry standard for game boxes and tokens. 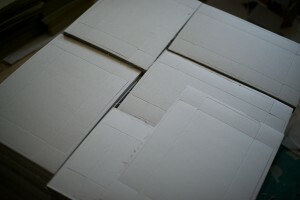 Die-cut chipboard box tops, ready to pop out, fold, glue, and label. 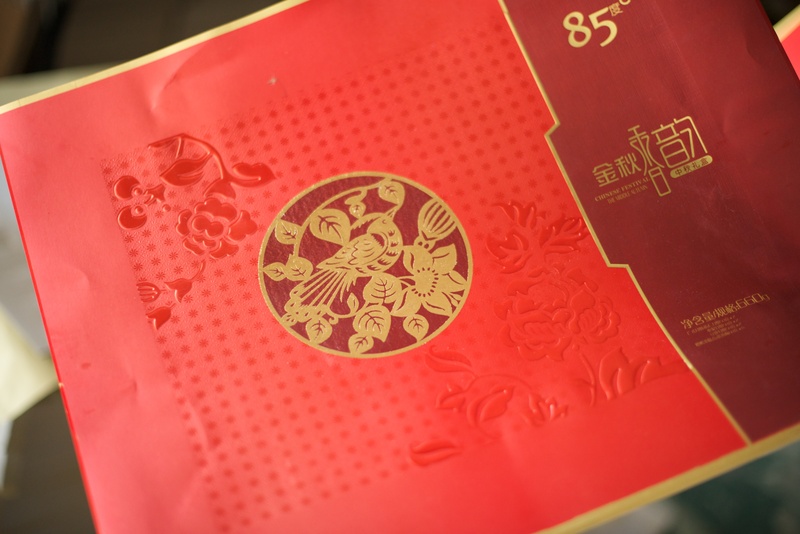 Side note: What we call “chipboard” in the industry, Chinese printers call “greyboard”. I find their name more descriptive, actually. Anybody else want to swap to the Chinese term for this one? 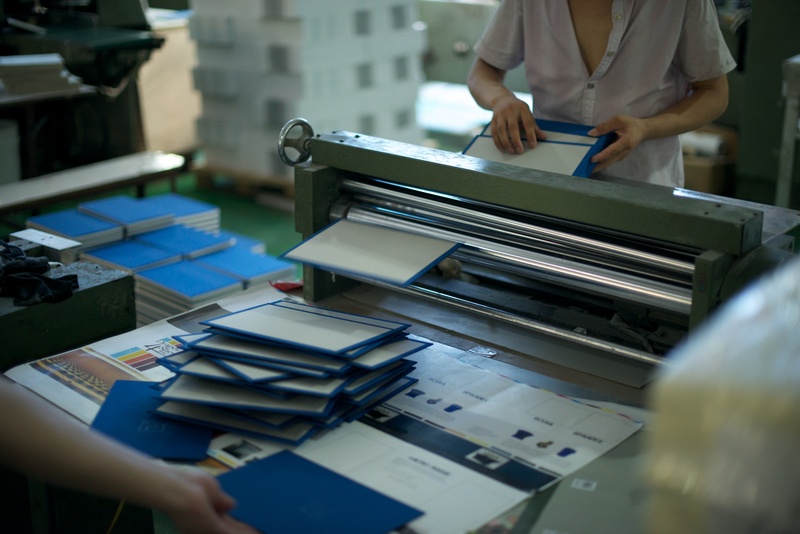 The bindery is the third of Longpack’s workshops, allowing them to turn out staple-folded booklets (like most boardgame rulebooks) up to hardback books. When I point out that they can do hardback books, as a board game publisher, that means to you that they have the tools and expertise in house for the folding game board itself. The techniques and tools for a hardback book cover and a folding game board are essentially the same. 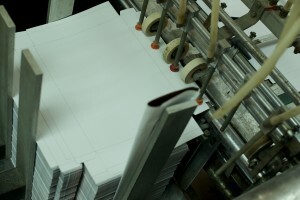 Handback faces, like a game board, get labels glued atop greyboard sheets. 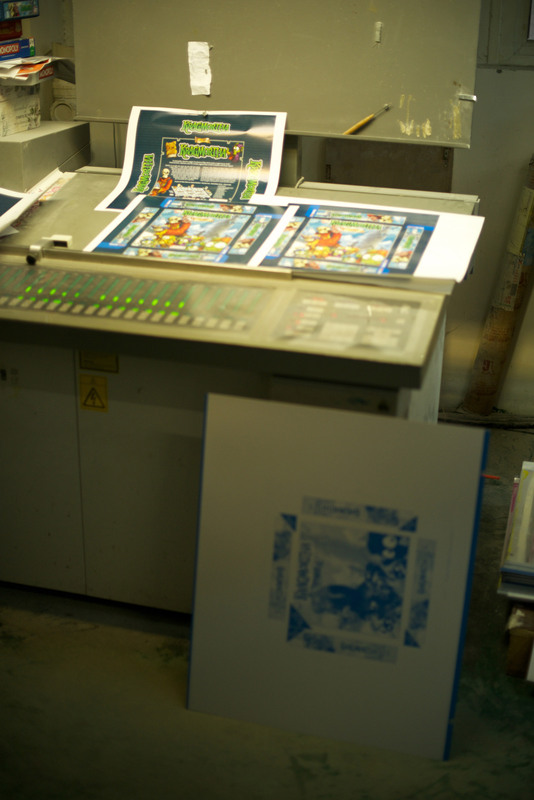 Here we see a screen printer being used to put a thin, controlled layer of glue onto the second face of a handback. After glue-down, the hardbacks are run between rollers, giving the label a final squeeze onto the glue & greyboard, and removing any bubbles. 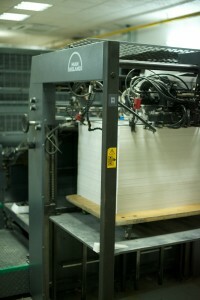 Stacks of pages go into one side of this machine. Folded & staple-bound booklets come out the other side. 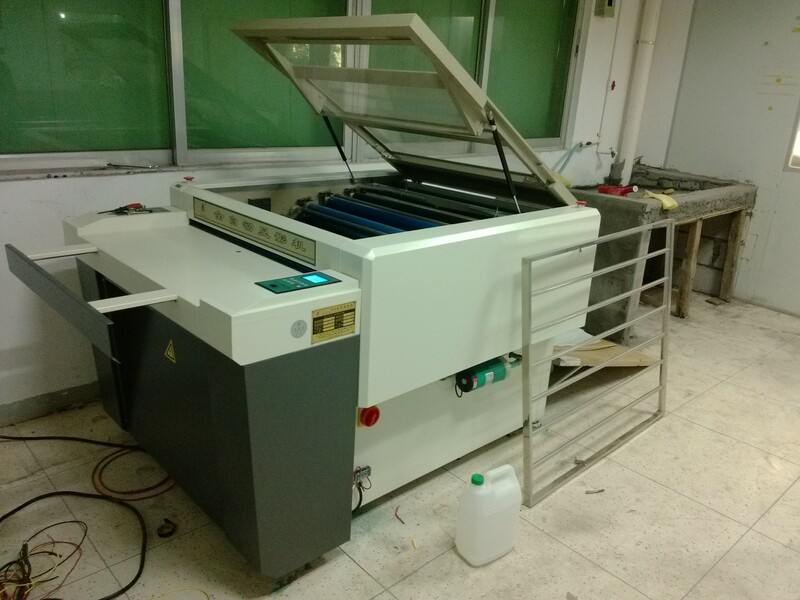 This is the machine that’s going to make your boardgame’s rulebook. A laminating machine in the bindery. Longpack keeps many lamination options on hand, from gloss to matte. Upstairs from the main bindery floor and its monster machines is a floor set aside for manual labor, with multiple assembly lines. Ning points out that this is where they’d do the final assembly of a board game. Like other printers’ assembly lines I’ve seen, it’s basically a table with a rolling belt on it that carries the work past. For game assembly, that would mean a worker at each station with shelves full of each component to put in the box. One person might toss in the bag of dice as the game rolls past, another the punchboards, and so on. A scale at the end of the table serves as a quick sanity check to make sure nothing was left out. 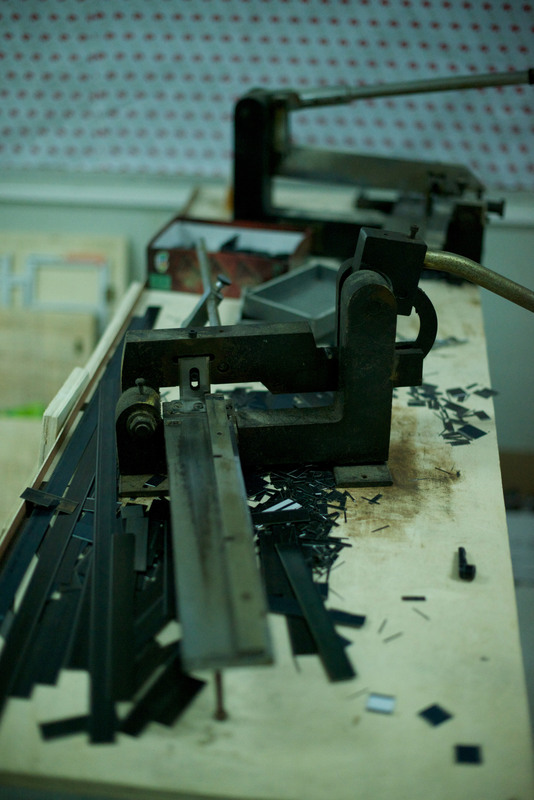 Assembly lines on the manual work floor of the bindery. There have been smaller manual-work tables near the big machines in every other workshop. Sooner or later, a customer will ask for something that Longpack doesn’t have a schoolbus-sized machine to do at 10-copies-a-second. For that eventuality, there are tables scattered here and there, one for every few big machines, each with a few workers around them. A table for hand work. This time it’s gluing codexes into hardbacks, for a non-standard book size. So that’s the impressive range of what Longpack can do in-house: Boxes, inserts, staple-bound rulebooks, game boards, punchboards of tokens, final assembly and shrink-wrap. Looking at just what this factory complex can and can’t do without shopping parts of the job out is a reminder of the demands that game publishers put on our printers. Even with three giant “workshops” of highly specialized machines, Longpack still will need to shop out many parts of a game printing job: Injection molded plastic parts, vacuum-formed plastic liner trays, dice, wooden bits and meeples. Even something as close to their business as cutting decks of cards they’d send to an outside shop. When we send in the specs for a game with more than a few parts, we’re nearly always actually getting the work of a few different factories. 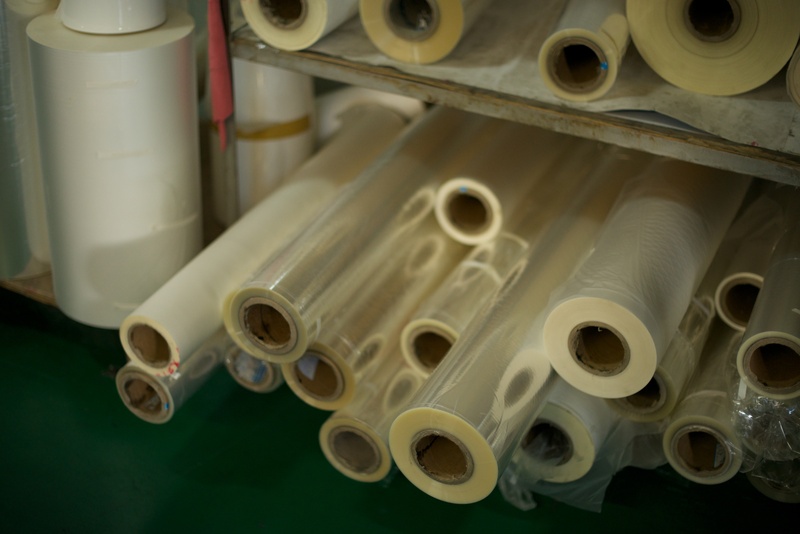 Longpack is coming from an extensive background in printing, with the ability to do a wide variety of parts in-house. 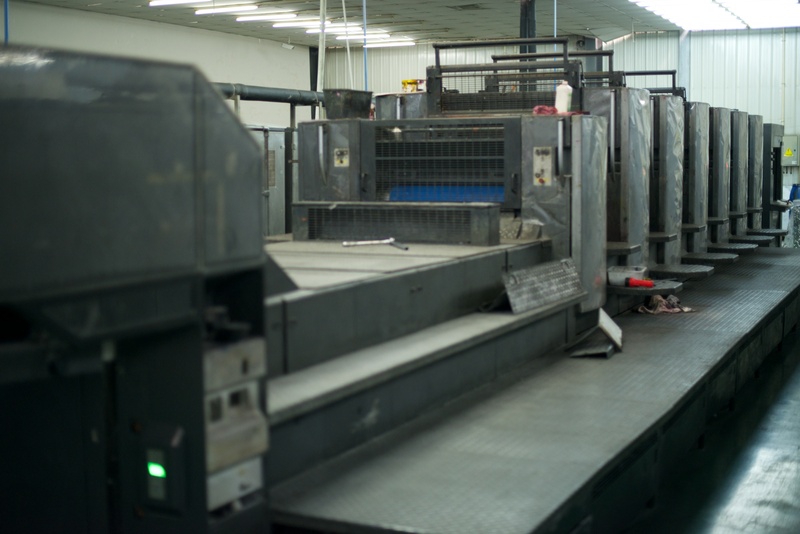 They’re big, with presses that will turn out thousands of prints in an hour, yet they’re hungry enough to get into this business to accept order sizes as low as 1,000 copies. Drying: Longpack showed me a single drying room, slightly higher tech than ones I’d seen at smaller game presses, for their entire campus. And that’s a big campus. 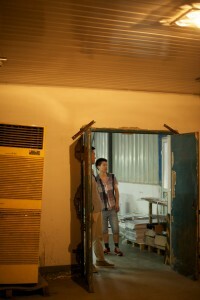 I asked them if they had more, and if one room could service all their drying needs during the rainy season (June/July). They shrugged off the question a bit, saying that most jobs only needed a few hours in the drying room, and that if they needed to they could turn other rooms into drying rooms or even get additional space for drying by working out a deal with other printers in town. If your game is going to print near the rainy season, I’d make sure to include guarantees on drying time in the contract, to make sure that it gets the attention it deserves. Longpack’s drying room, with a standing dehydrator and heat lamps. 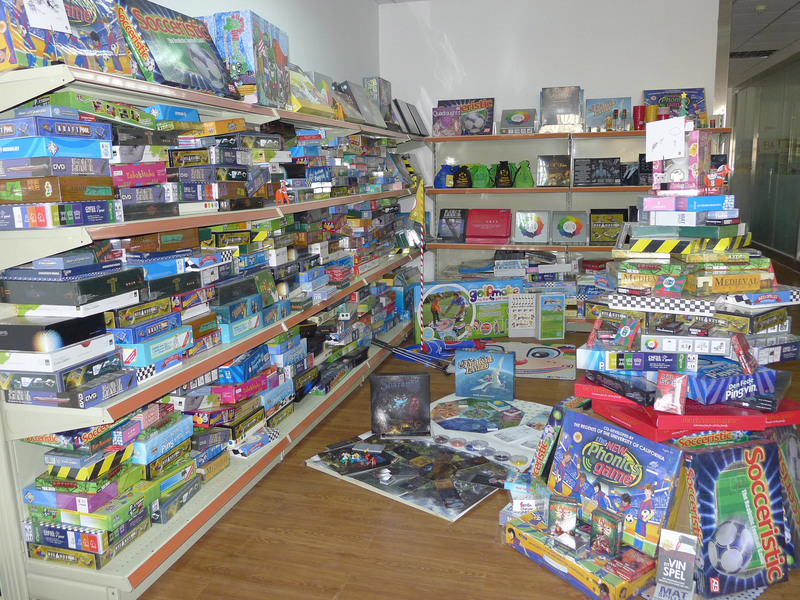 They’re well positioned to get into this business, but they’re really new, and China doesn’t really have a boardgame playing culture, outside the HKSAR. Concepts and terms that you assume any boardgame player (and certainly a boardgame factory) would know, they’re just now learning. I had the pleasure of introducing them to the idea of a ‘meeple’. 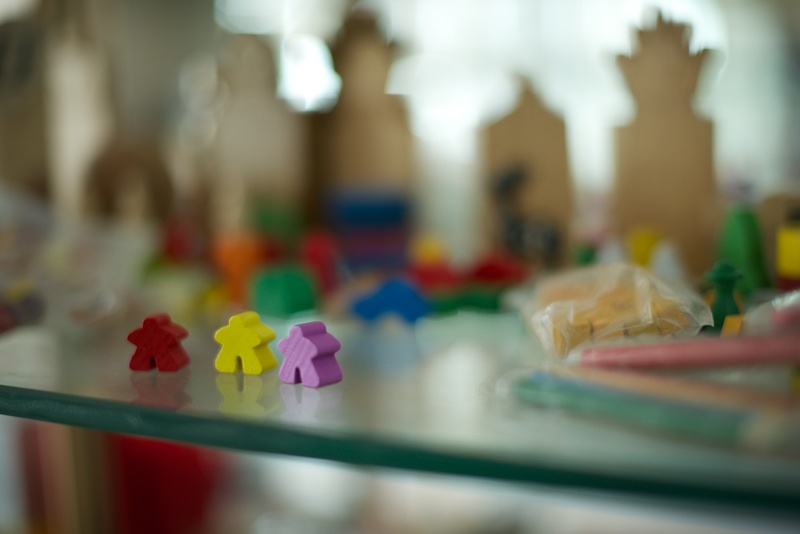 The idea of mass manufacturing painted 2D wooden game pieces as a standard component was new to them. 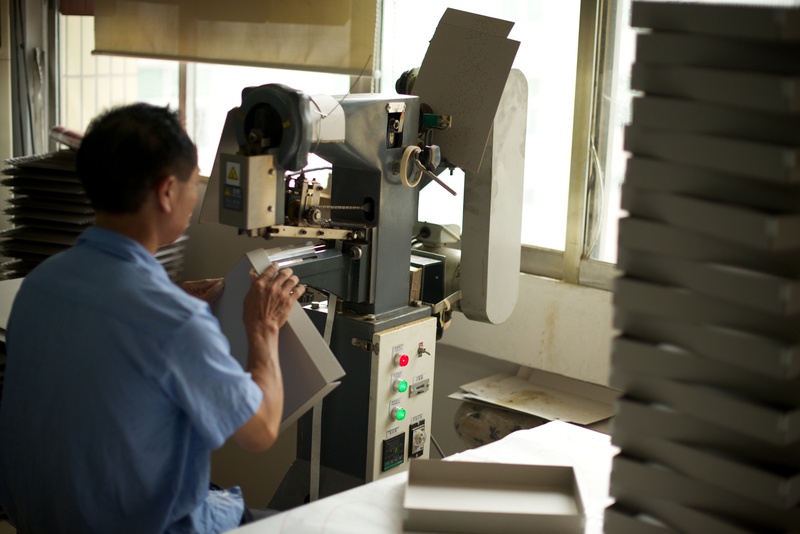 While these guys have their process and quality control for printing to cardboard down, if you’re reading this soon after I write it, (July 2013) you may find gaps in their knowledge of some components common to the boardgames industry. You read all the way past the footnotes? Have a bonus picture. 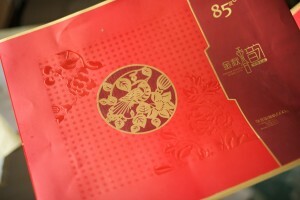 This is a sample of an embossed label, ready to be glued down to packaging inside the boxmaking workshop. Another 3D effect they had on display in the bindery was stamping into the greyboard, leaving the impression of a seal under a cloth cover. Click on the picture for a higher resolution view to appreciate the detail. Edited: 28MAY15: Updated link to Longpack’s new website. When the patents ran out on FDM-style 3D printing, there was a rush of little companies and hobbyists that moved into the space. They brought the costs down fast, and they’ve been competing and cooperating ever since to improve the technology. But FDM isn’t the only 3D printing technique out there, and some of the alternatives have some real advantages. However, most of the other 3D printing techniques are out of reach for the average game designer. Most of these techniques are still under patent protection, and available only as machines costing in the neighborhood of $100,000. Or they have been picked up by a much smaller section of the hobby market and aren’t as well developed in the open source community: It’ll take far more dedication and expertise to put one together on the cheap. 1) Formlabs soon-to-arrive Form 1 printer, which uses SLA (Stereolithography) rather than FDM techniques, and is expected to be available for ~3,300$ in August of this year. The Formlabs printer looks very promising, though with only videos of prototypes to judge from, it’s all speculation at this point. In theory (and from the videos), their new, affordable SLA style printer should open up higher resolution, more reliable 3D printing to the masses. It’ll still be slow, use expensive materials to print, and require some (less?) hand-work after the print to clean up. But SLA can produce smooth models where FDM leaves lines, sometimes gaps, on the model that are visible to the naked eye. I’m also keeping an eye on Formlabs to see if they make it at all. After the close of the Kickstarter campaign that funded their first line of printers, they got slapped with a lawsuit from the 600 pound gorilla of the 3D printing industry: 3D Systems. 3D Systems claims that Formlabs made use of some of their not-yet-expired patents in making the Form1 printer. I’m not in a position to judge the merits of that claim, but I do make strong objection to one thing 3D Systems did in pursuing the suit. They not only sued Formlabs, but Kickstarter as well. That’s just evil. Attacking a company that has enabled so much progress is already an immoral move. Holding them responsible for evaluating the Intellectual Property standing of anyone who applies to run a crowdfunding campaign could kill the whole industry, if a judge lets it happen. Will Formlabs survive their lawsuit from 3D Systems? Is there any merit to it, or is it just an attempt to stifle an up-and-coming competitor that charges 1/30th the price for a printer that 3D Systems does? I’ll be keeping my eyes on the case for the answers to those questions. Shapeways is a 3D printing shop that will print most any 3D technique for you, for the right price. You don’t have to worry about the technical details. You just upload a model, choose your material from a list, and pay a pretty penny. Some weeks later, the completed print shows up in the mail. Shapeways is available now. They’ve been in the industry for years, in fact. They make 3D printing as painless as it can be, as long as you don’t mind paying one-off prices for high-tech products. (Read: Not Cheap.) And as long as you don’t mind your print job being in a couple-week-deep queue before it gets printed, and then taking a few days more in the mail. They can print in plastic, metal, or more exotic materials. You don’t need to know anything about 3D printing to use them. You just upload a model file and give them your credit card number, and you’re off. As ouch-not-cheap as Shapeways is, the price is fair. We’re dealing with new technologies and one-off jobs here. Their cost in skilled labor and keeping up with technology is nothing to deride. And if you want to go it yourself with your own home printer after seeing their prices, calculate the break-even price on how much you’d have to print to make it worthwhile. Include the cost of your time, the cost of the plastic (which is surprisingly expensive) and the cost of your time to learn and maintain the printer. 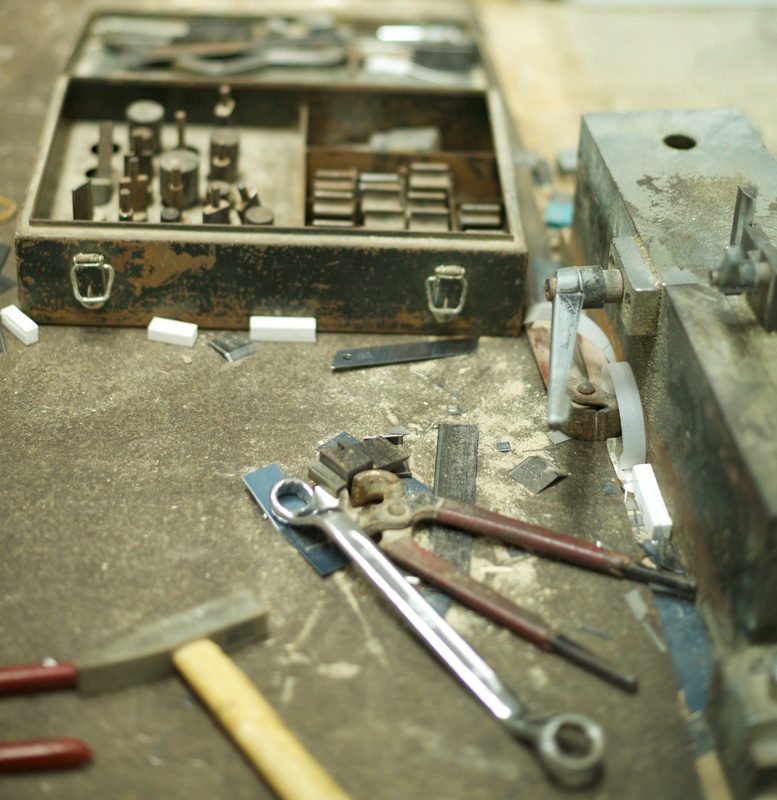 These are bleeding-edge devices that require some TLC to keep in working order. You may find that Shapeways is a better deal than they look at first glance. There are MANY other ways to print in 3D. 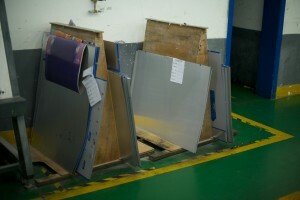 … you can harden a bed of metal by welding (actually, sintering) it together with a laser. This technique is called “SLS” (Selective Laser Sintering) and it’s a much beloved technique among high-tech artists. The cost per piece keeps it out of the hands of most of the rest of us. …. you can harden a bed of concrete or plaster of paris by simply wetting it in the desired shape. One hobbyist at this years Make: Hardware Innovation Workshop was showing off a 3D printer made on this design using a hacked inkjet cartridge to deliver the water on target! 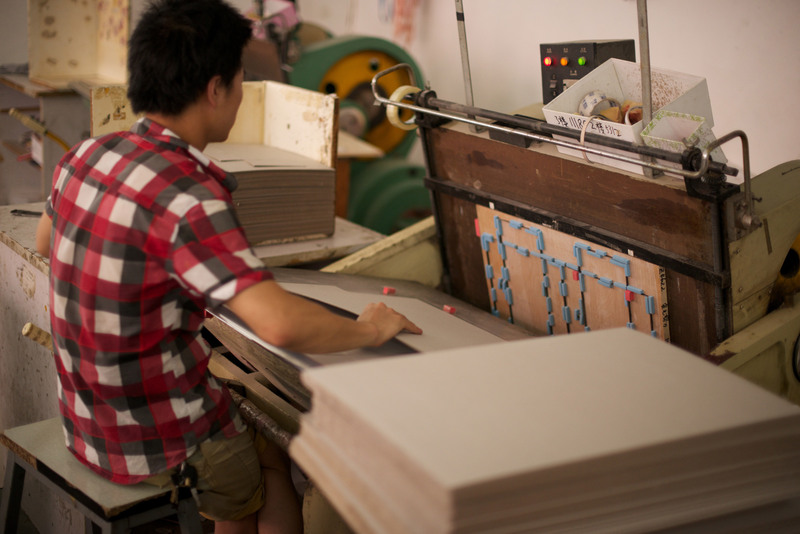 … you can have a 3D printer lay down epoxy onto a bed of powdered stone to create faux-granite. The D-Shape printer proposes to do this at the scale of whole buildings: You’d assemble the printer atop the foundation of a new house. A week or two later, drain off the leftover powdered stone leaving the walls, stairways, and electrical conduits of a building standing at the center, ready to be wired, windowed, and finished. … you can fuse sugar into a solid model with a heat gun; essentially an industrial strength hair dryer. The “CandyFab” does this. Or you can do a similar technique in glass: One artist at last year’s Burning Man used sunlight, redirected and concentrated with mirrors and lenses, to melt sand into primitive glass 3D models. Once you start to wrap your head around the core ideas of 3D printing, and break it down to its component parts: A material to be fused, a way of fusing it, and computer control of the fusing process, the number of ways the idea can be remixed are limitless. For now, FDM, with its syringe of molten plastic, is what’s available at hobbyist prices. But the horizon looks promising indeed. The 3D Print and Play industry is just starting. Hobbyists who have 3D printers want things to print, and we’re starting to see some games to fill that gap. 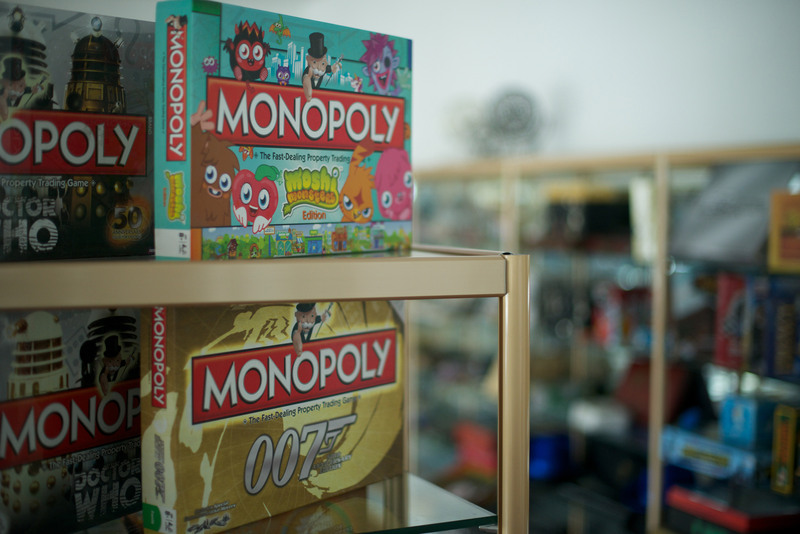 The game designer provides the 3D models files and the rules. 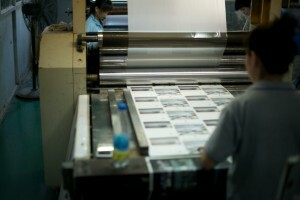 The hobbyist downloads them and prints them off at home. I’m biased, because their office is the next door down from mine and because they’re incredibly nice, smart people. The short answer: For a prototype? Maybe! For mass market? Nooooo…..
With current costs and technology, 3D printers for a mass-market board game aren’t even close to practical. a) The cost of the plastic is very high: ~40$/kg Home filament makers like the “Filastruder” may bring this drastically down in the coming year. b) The resolution is visible to the naked eye, and requires fine tuning to optimize, including retuning with each new roll of plastic loaded. c) The prints are slow. A single chess pawn might take 15 to 30 minutes to print on a typical FDM printer. That’s a full day to print a single chess set. Conventional injection molding machines could turn out hundreds or thousands of sets in a day. d) Hand labor is still needed to clean up many shapes of print after the fact. If your shape has an overhang in it, there needs to be a support “raft” under the overhang that you trim away after the print is done. 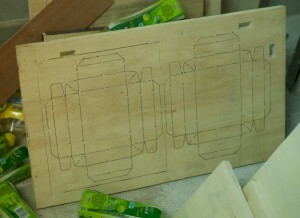 FDM printers can’t lay down shapes floating in open air: They have to lay the shape down onto something. Say you want to make a model of a man pointing off into the distance, his arm straight out? You’ll click the “support” box on in your printer software so it can build a raft under the outstretched arm, and then you’ll trim it off by hand when the print is done. Slight overhangs are fine: Anything up to ~ a 45 degree angle the printer can build on the layer before. But a sharp overhang demands a raft, and that means hand labor to fix up after the print is done. e) FDM printers need frequent maintenance to unjam the extruder heads, etc. For these and other reasons, injection molding for plastic components, with its high up-front cost will likely remain the technology of choice for the foreseeable future. 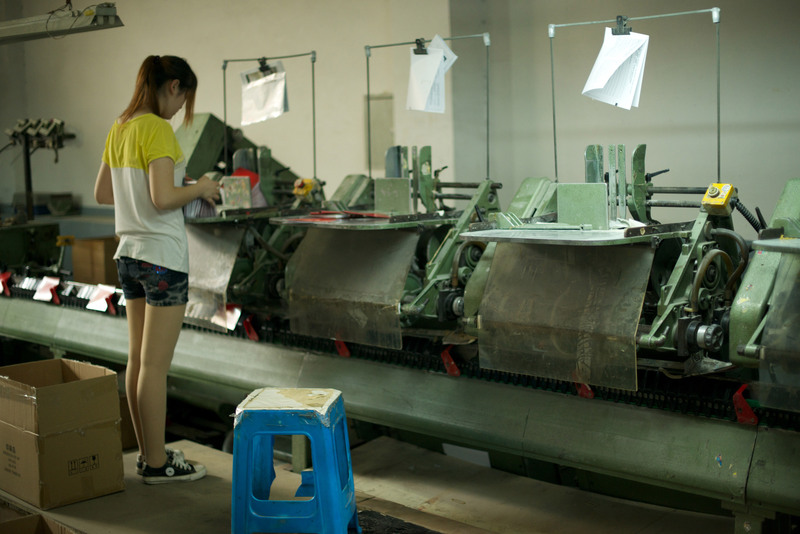 FDM printing is an awesome technology, but it has its limitations to be aware of. For now, it’s best for prototyping components and making sure your models look good, balance right, play right, etc. 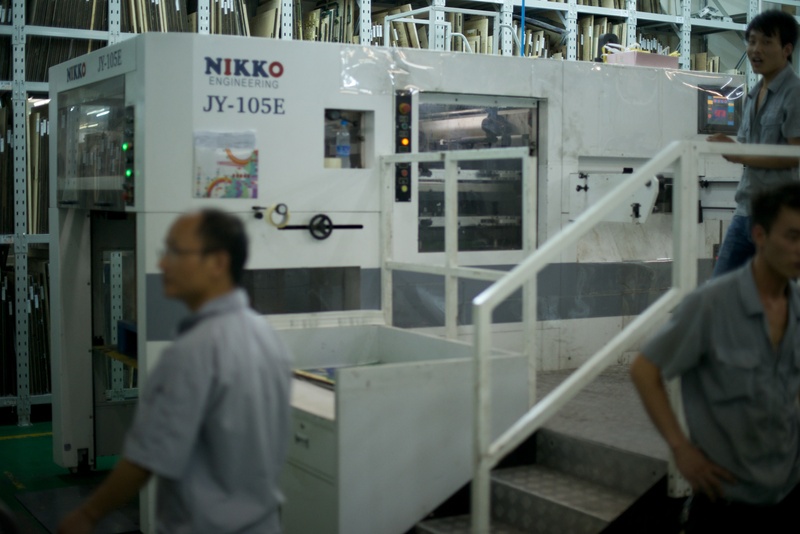 As expensive as the tooling costs for injection molding are, it gets the job done for mass production. 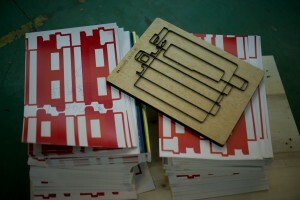 FDM printing might be appropriate 10 to 50 sets for beta testing or an extremely limited release. But even then, you might be better served by using off-the-shelf & repurposed components. Thornhenge LLC is an Oakland California based company that makes games. Our first game is “Lyssan”, a strategy boardgame for 2 to 4 players. Check it out at Lyssan.com.